What if the Yankees NEVER give up a run? We are now into day TWO of the Baseball season preview, yesterday we looked at the Yankees offense, today we will look at the pitching staff of the Yankees that will try to LIMIT the runs given up as the Yankees get ready to WIN their TWENTY-EIGHTH World Series Championship. The Yankees rotations retains ALL of their pitchers from the END of last season that helped them reached Game SEVEN of the ALCS. 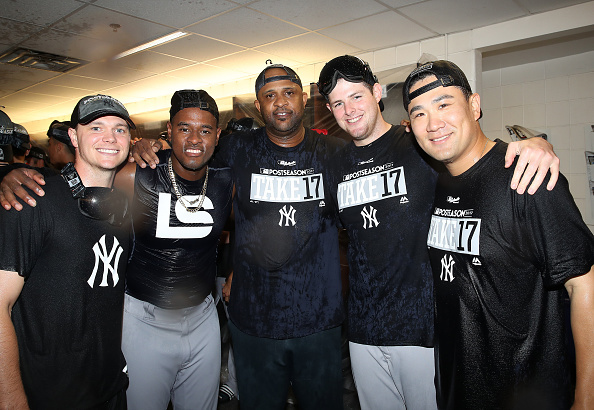 Luis Severino and Masahiro Tanaka were LEADING the rotation while CC Sabathia and Jordan Montgomery, were great BACK-END starters. The Yankees have the BEST bullpen in baseball that I think can get even BETTER this season. The Rotation is not the ISSUE for the Yankees, but it is their WEAKEST part of the roster, which is SCARY for other teams in the American League. Nobody had ANY faith in Sevy as a starter in 2017 after he had STRUGGLED in that spot in 2015 and 2016, most people believed that he would RETURN to the bullpen at some point last season, but he finished THIRD in the AL Cy Young voting. Sevy was the BEST pitcher on the Yankees all season and his stuff was DOMINATING at times last season. He had the honor of pitching the FIRST game of the playoffs last season, and even though he struggled in that game, he recovered later on in the Postseason. He will be pitching on Opening Day in Toronto next week and I have NO problem with it. Sevy is ONE of the best pitchers in baseball and SHOULD make the All Star team this season. The LOOMING question around Tanaka for the past THREE years has been his elbow. It seems as if his PARTIALLY torn ligament has HEALED and Tanaka will be healthy this season. He was the ACE of the staff at the start of LAST season but did NOT act that way for the majority of the season. He was able to become a VALUABLE starter later on in the season and I think having LESS pressure this season will help him perform better this season, as he is no longer the BEST pitcher on the team. Tanaka is a really GOOD pitcher, but can he become GREAT this season? Most people thought CC’s career with the Yankees was OVER at the END of 2017 and all of last season was just a way to honor him, but he had OTHER ideas. He did NOT lose a game when the Yankees were coming off a LOSS and was the ULTIMATE streak stopper, even in the Postseason he pitched GREAT and helped the Yankees on their run. He pitched Game FIVE of the ALDS in Cleveland and could not have pitched better. I have very LOW expectations for CC this year as he is getting OLDER, but if he can continue to be a Streak STOPPER then the Yankees will be DELIGHTED. Sonny arrived in the Bronx in a MID-SEASON trade with the Oakland Athletics and took some time to get ADJUSTED to his new team. Gray did not reach his FULL potential last season with the Yankees and that is why he is the FOURTH pitcher in the rotation for the Yankees going into the season, but he is BY-FAR the BEST fourth pitcher in baseball and should move up to the TWO spot if he reaches his FULL potential this season. The sky is the LIMIT for Gray, he just has to adjust to the Bronx and he will be GREAT. Monty was called up the BIG leagues early on last season and gave NO choice to the Yankees to send him down until towards the END of the season when he came near his innings LIMIT for the season. He was GREAT in his rookie season last season, I think he will take the NEXT step this season with not having a HARD innings limit at the END of this season. He is going to be part of the Yankees rotation for MANY years to come and he is not even CLOSE to reaching his CEILING just yet. The Yankees have ONE of the best rotations in baseball which is going to DOMINATE the American League this season. IF the rotation does have some STRUGGLES, then they will hand the ball to the BEST bullpen in baseball. The Yankees had a GREAT bullpen last season but got even better after the acquisition of David Robertson and Tommy Kahnle at the Trade Deadline. The TRANSITION of Chad Green from becoming a FRINGE starter to being a KEY arm in the bullpen is one of the BEST things that has happened to the Yankees in the past FEW seasons. Green, Kahnle, and Robertson are some of the BEST middle relievers in baseball and come into the game at ANY point and DOMINATE. Dellin Betances STRUGGLED a LOT last season, early on this season, I want to see him PROGRESS or else he might be someone that is traded at the Deadline. Aroldis Chapman showed some FATIGUE at the Closer Spot, but he should not have ANY issues this season. Under PREVIOUS manager Joe Girardi the team made ONE or TWO changes to the pitching staff after EVERY game, it will be interesting to see how Aaron Boone deals with the staff. Arms like Justus Sheffield and Chance Adams are going to start the season in Scranton, but if there ANY injuries to the rotation, they will take the Shuttle EAST to the Bronx and join the rotation. That was a look at the Yankees Pitching Staff, which I expect to be OUTSTANDING this season. I will some Predictions next week including how I think the Yankees will do and who will WIN the World Series so Stay Tuned! Well said. I don’t think the Yankee rotation gets enough credit because of how dominant their offense is. That rotation has some incredible names in it and was top-five last season. As long as they all stay healthy, I expect nothing less.